I'm taking a moment today to remember Pearl Harbor, and all that happened there on December 7, 1941. The events of that day changed the course of our history as a nation, and the history of the world. The commemoration of "Pearl Harbor Day" each December 7 is imbued with a solemn dignity in ceremonies throughout the United States, and remembrances of the day often serve as a "teachable moment" that connects new generations of Americans to a particularly crucial turning point in the nation's history. The day has always held special significance for me, because my Dad, John E. Walsh, was stationed at Pearl Harbor as a member of the U.S. Navy on December 7, 1941. John E. Walsh and friends at Pearl Harbor, 1941. 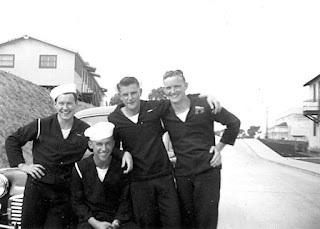 Just twenty years old, Dad was enjoying Navy life in Hawaii that Fall — snapshots from the days before December 7 show him and his buddies, many from his hometown area of Peekskill, New York, smiling and obviously happy to be among friends when so far from home. In those days before everything changed, Dad taught Sunday school to some of the local kids. It was a big deal to have some pineapple for dessert, or a beer with the guys when he wasn't in class, training to be an airplane mechanic. Then, on a Sunday morning at the end of the first week of December, there was a strange hum in the sky, and within minutes, the air was thick with smoke. Within hours, a heavy smell of death hung in the air, and the harbor was transformed into a graveyard for many U.S. servicemen. The sights and sounds of those hours stayed with Dad for the rest of his life, but he rarely spoke of them unless asked. Knowing him as well as I did, I suspect that he held those things sacred — as you might honor the final hours of someone close to you — and as a result only felt comfortable discussing them in the reverence of an appropriate time and setting. In the chaos of that morning, as everyone scrambled to do what they could to get planes in the air and mount some sort of response to what was happening, Dad at one point fell or was knocked to the ground, receiving a cut to his knee. The moment allowed for no attention to anything less than major injury, though, so he simply got up and went on to his next assignment, just as so many others did that day and in the following weeks, despite the shock and confusion of injuries large and small. The days following December 7 were as grim and serious as the days before had been joyful and carefree. The idylls and innocence of youth were replaced with grave, exhausting attention to detail and a determination to honor those who had been lost. Dad always felt blessed to have survived December 7, 1941 at Pearl Harbor. He sometimes referred to it as his "second birthday" that year — the start of an entirely new time in his life. He was grateful to have survived that day, and proud to later be part of the support apparatus for the Battle of Midway, which historians point to as the turning point in the war of the Pacific, and the United States' answer to the attack on Pearl Harbor. I feel blessed today to honor my Dad and to remember all those who have served with honor, in pivotal moments like Pearl Harbor on December 7, 1941 and throughout our long history as a people of courage and determination, and joy and innocence, in war and in peace.